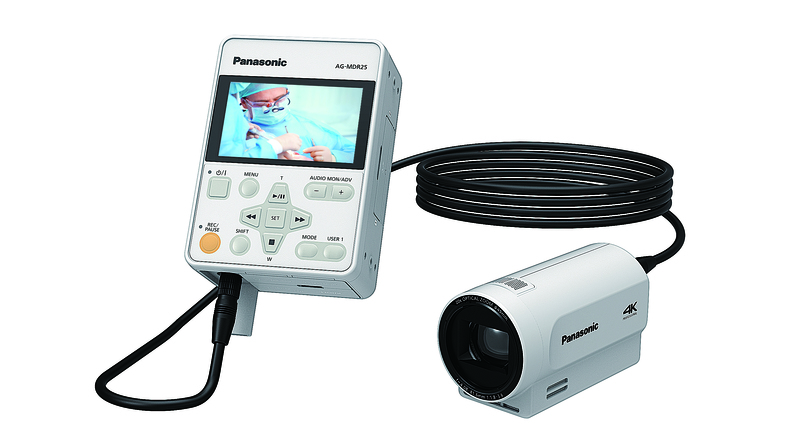 Compact, lightweight design and remote operation allow the camera to be installed in various medical applications. 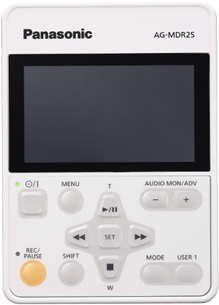 Improved recorder operation with a touch-panel display and large buttons. 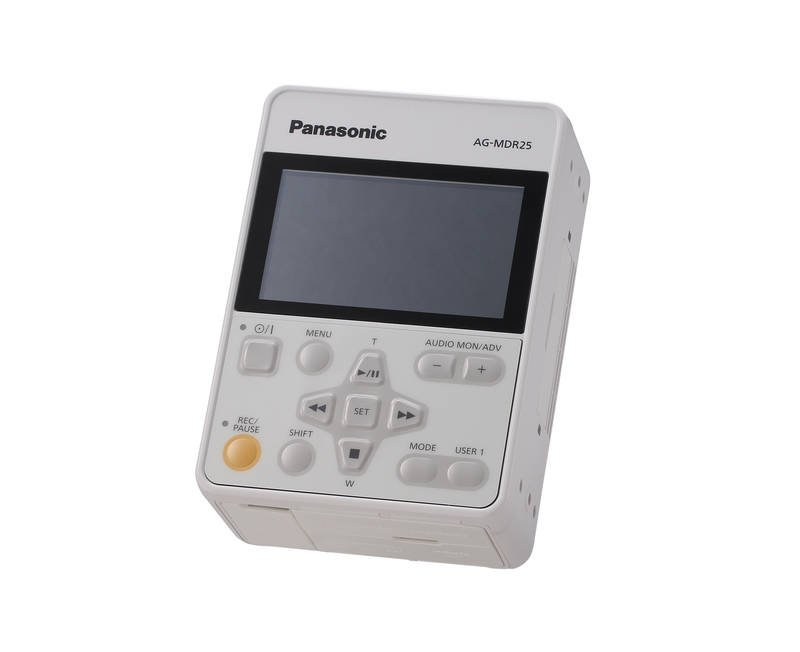 DC drive: equipped with input terminal for DC12V power supply (AC adaptor is included). High resolution 16:9 screen, 3.5-type, approx. 1.15-megadot panel touch panel for multifunctional operating ease. LCD reverse display: The image displayed on the LCD monitor can be reversed vertically and horizontally. The camera head can be reversed vertically to match installation conditions. Medical Electronic Device Safety Standards (IEC 60601-1) and EMC Standards (IEC60601-1-2). * In AC 240V/60Hz it does not comply with this standard. A lens protector (MC Protector/Accessory) for the front panel of the Compact Camera Head is included as standard equipment. Protects the lens from splashes. The control section of the Recorder uses switches covered by a membrane sheet. The surface has few bumps and indentations, so cleaning is easy with an ethanol disinfectant. 29.5 mm Wide-Angle Lens achieves 29.5 mm wide-angle in spite of its compact size. 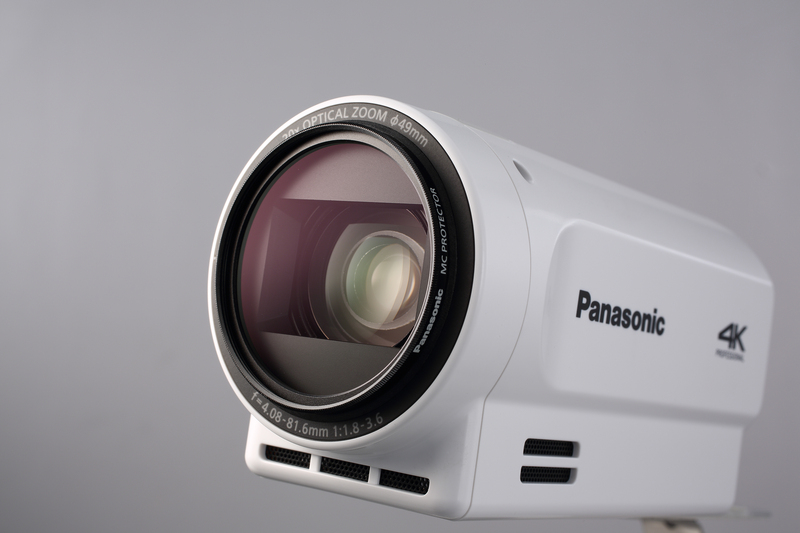 Optical 20x zoom covers a range from 29.5 mm wide angle to 612 mm close ups (35mm equivalent) for various applications. 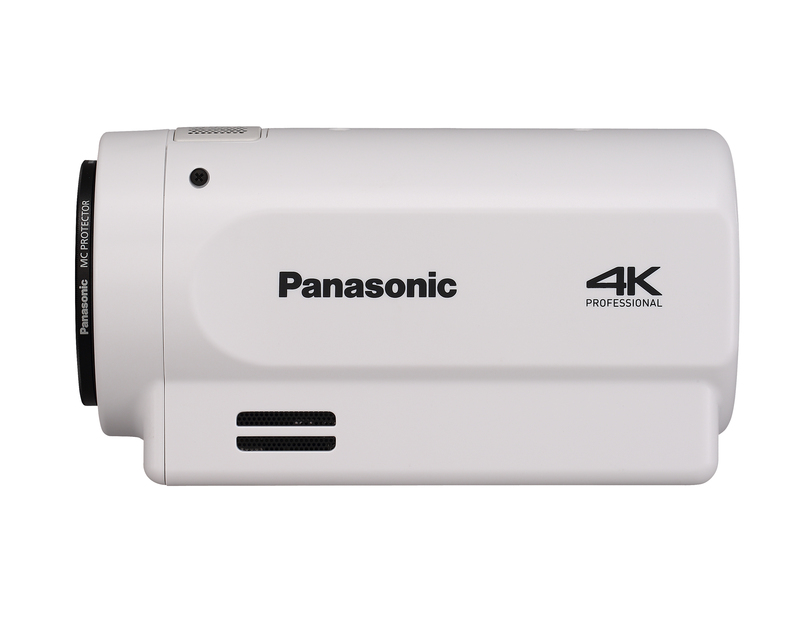 Intelligent (i.Zoom): Allows shooting up to 30x in HD format (22x in 4K) with high resolution. 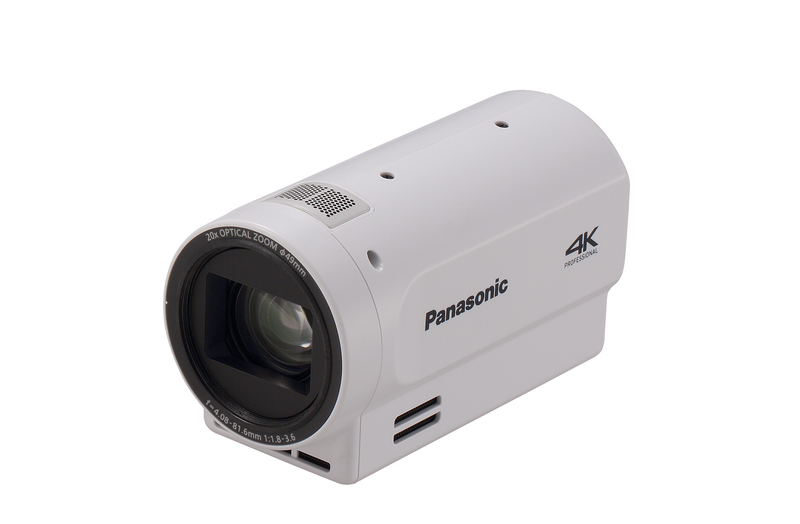 Compact Camera Head features a progressive MOS sensor with a total of 1.276-megapixels. The Recorder supports, in addition to 4K (UHD: 3840 x 2160) 29.97p/23.98p/25p * and FHD (1920 x 1080) 59.94p * images, multiformat image acquisition. * 4K refers to UHD (3840 x 2160) resolution. 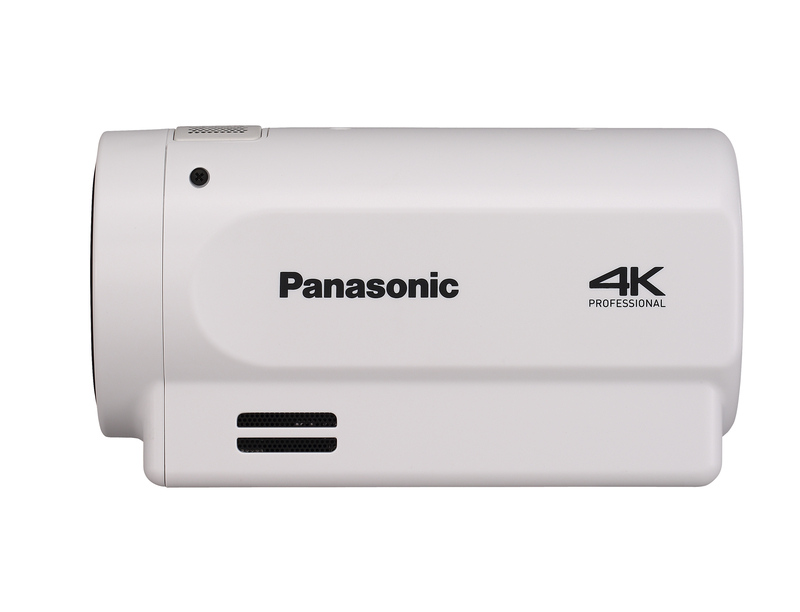 The maximum resolution in 4K shooting mode via HDMI/SDI output is FHD (1920 x 1080) 59.94i/50i. 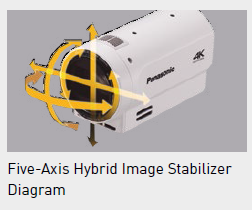 Five-Axis Hybrid Image Stabilizer (HD): In HD mode, electronic image stabilization is added to the optical image stabilizer (OIS) system to detect and correct motions on five axes, including rolling motion. Surgical Light mode: Equipped with a Color Reproduction Matrix mode for use under a surgical light. 16-Axis independent color correction: This function provides an independent effect to each of the 16 phases and saturation levels of video images. With this feature, special surgical colors can be adjusted. Optical ND filter: The optical ND filter can be manually switched (CLEAR, 1/4, 1/16, 1/64). Resolution degradation from closing down the iris is prevented even in the bright lighting of a surgical light. The LAN terminal supports video and audio streaming distribution to networks, as well as file transfers and external control. Access from PCs and tablets is achieved by web browser, with no special app required. 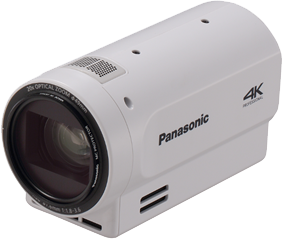 Control is also possible by a Panasonic remote camera system IP controller for integrated system operation. 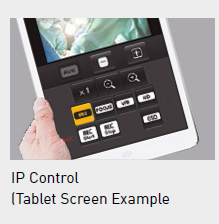 IP control: Remote control from a PC, tablet or IP controller enables Rec Start/Stop, Clip Delete, and compact Camera Head control (Zoom, Focus, Iris, and Menu Settings). 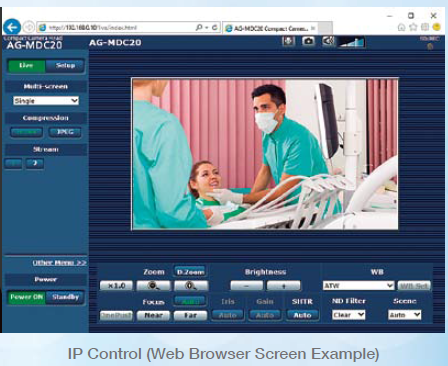 IP streaming: Video and Audio IP streaming supported. Signals can be received and monitored by PCs, tablets, and IP decoders. SDI input: An SDI input with 3G-SDI support is equipped. 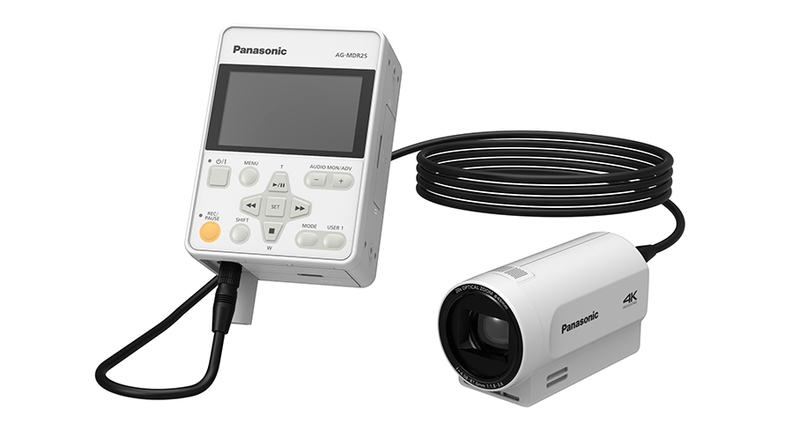 This lets you connect to a medical system or other video device and record multi-format images, including FHD (1920 x 1080) 59.94p/50p/23.98p/25p progressive images. SDI output: 3G-SDI compatible SDI output is equipped. FHD (1920 x 1080) 59.94p/50p progressive images can be output to an external monitor. HDMI output: HDMI output of 4K (UHD)* / FHD images is supported. * HDMI output of 4K (UHD) video is available only for playback of 4K (UHD) recorded clips. Two REMOTE terminals: External control is enabled for Rec Start/Stop, Zoom, Focus, and Iris settings. 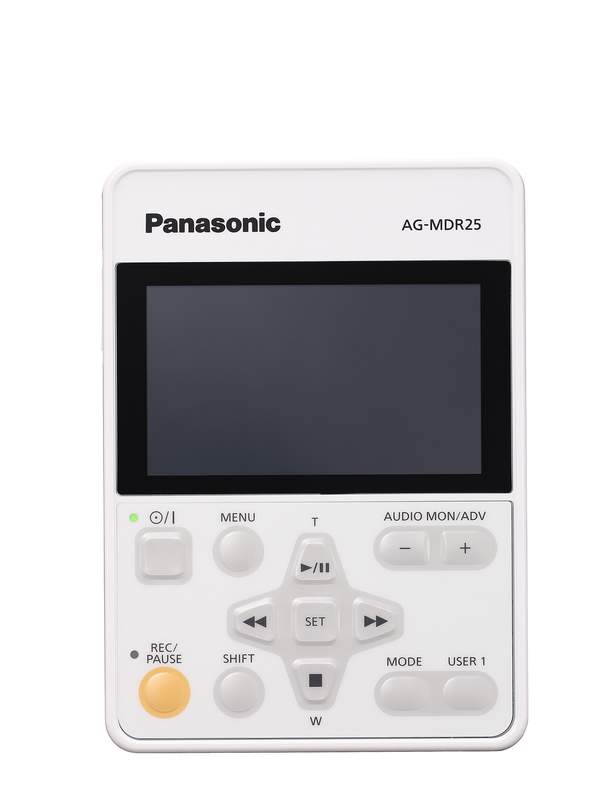 *When connected to the compact camera head, the audio input cannot be used. Resolution 3840 x 2160/640 x 360: Frame rate (59.94 Hz) : 30 fps, 15 fps, 5 fps Frame rate (50.00 Hz) : 25 fps, 12.5 fps, 5 fps Resolution 1920 x 1080/1280 x 720: Frame rate (59.94 Hz) : 60 fps, 30 fps, 15 fps, 5 fps Frame rate (50.00 Hz) : 50 fps, 25 fps, 12.5 fps, 5 fps *By the conditions, the frame rate is lower than setting.